GREAT dining experience especially if you love great Italian in a beautiful setting. Pros: Great northern Italian dishes in a stylish bistro! Cons: Pricer than other places in LIttle Italy, but treat yourself to the best of the best! Imagine walking down narrow cobblestone streets underneath fire escapes while smelling the wonderful scent of homemade, delicious Italian foods. Envelope yourself in the sights, sounds and smells of Italy and feel the rich Italian culture all around and do it all close to home. If you have always wanted to visit Italy but never had the time or money for such a long trip, then Little Italy is just right for you. Little Italy is located in New York City and is a piece of the city like no other. 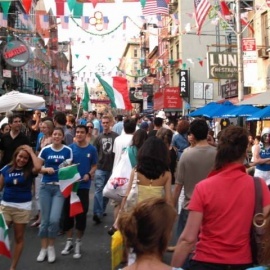 When visiting Little Italy you may want to try to arrive around the second Thursday in September so you can experience the Feast of San Gennaro, an 11 day street fair celebrating Italian culture and the Italian American community as a whole. There you will find many proud Italians celebrating and tons of vendors selling foods that everyone is sure to enjoy.